The Case Study I have chosen is the Denby Dale Passivhaus. The rationale behind this decision was mainly due to the wealth of resources provided compliment of Green Building Store on this Passivhaus project. This project was the first certified Passivhaus in the UK to be built using cavity wall construction and has pioneered the combination of British vernacular construction methods with the German low energy Passivhaus design methodology. The dwelling also boasts a 90% reduction in energy use for heating compared to UK average; with heating costs of about £75 per year. The total cost of the build was a mere £141,049.34. The foundation used on this Passivhaus build is very similar to the traditional Irish Strip Foundation however it differs in one main area - its elimination of thermal bridging within the structure. 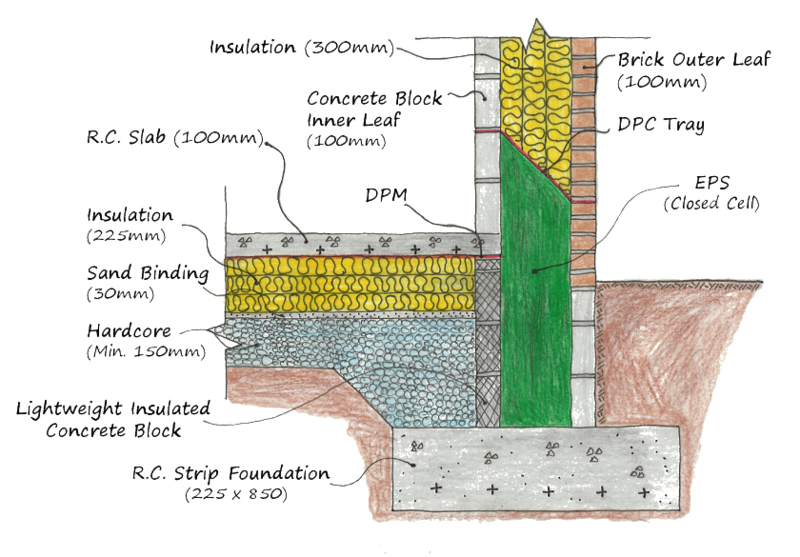 When we examine the traditional Irish strip foundation (U value of 0.21 W/m2K) we discover thermal bridges through the structure which hinders its performance; this is evident from the sketch on the right. 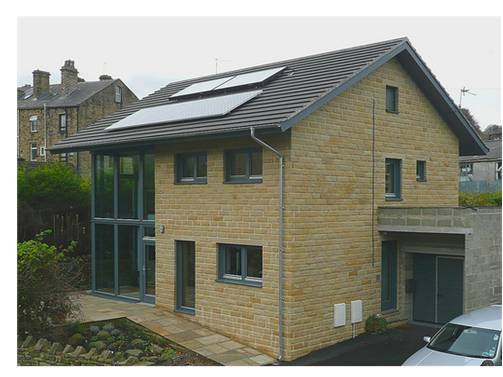 For the Denby Dale Passivhaus to gain certification it needed to obtain a U value of between 0.10 – 0.15 W/m2K in its foundation detail; by eliminating the thermal bridges evident in the typical strip foundation. Installing Insulated blocks on the inner leaf between the floor slab and the foundation to prevent any thermal bridging down the inner leaf. Installing 225mm of insulation beneath the floor slab to prevent heat loss through the floor. Installing 300mm insulation in the cavity which continues down to the foundation to ensure there is no thermal bridge through the walls or from the foundation. The insulation in the wall below the dpc tray (red) is expanded polystyrene or EPS; this is rigid and closed cell. This means that it will not soak up any water and its rigidity is to compensate for lateral loads below ground. To provide you with a deeper understanding and familiarity with the Denby Dale Passivhaus foundation; I have provided you with a simple sketch of the cross sectional detail of the foundation. The door threshold is one area in which eliminating thermal bridges is particularly difficult. 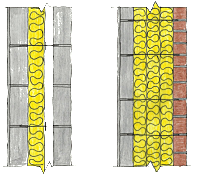 When we examine the standard Irish block cavity door threshold we can determine that there is a huge amount of heat loss by means of thermal bridging; this is evident from the sketch on the left. In order to eliminate these thermal bridges the Denby Dale project aimed to eliminate heat loss by super insulating. 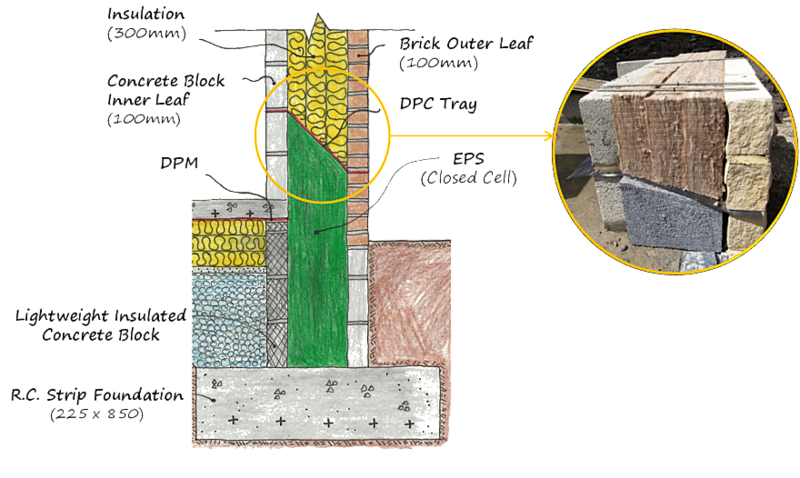 Like in the previous foundation detail, there is 300mm closed cell EPS insulation in the cavity; providing moisture resistance and rigidity. Furthermore, the blocks on the inner leaf are lightweight insulated blocks and there is 225mm of insulation under the floor just like in the foundation detail. However, this alone was not enough to eliminate the thermal bridging as there would have been a thermal bridge through the floor slab. To solve this problem, the concrete slab was cut back and in its place a 100mm x 100mm fibreglass box section filled with polyfoam insulation was inserted. This box was mechanically fixed to the edge of the slab by means of a resin grouted stainless steel threaded bar. To minimise heat loss the door step itself was created from EPS and covered with chequered galvanise for grip and durability. The sketches below clearly portray the comparison in terms of detailing between traditional Irish construction and what is needed to achieve the passivhaus standard. From the simple sketch on the top right handside of the page we can see the difference in the level of insulation between the traditional block cavity wall and the block cavity walling system used in the Denby Dale Passivhaus. The wall consists of 100mm concrete block inner leaf, 3x100mm Dri-Therm fibreglass insulation batts in the cavity and 100mm natural stone on the outer leaf. Below ground there is EPS closed-cell insulation (grey insulation below the wall batts). This will provide stability if there is any ground movement and also as it is closed cell it will not absorb any moisture. In terms of moisture resistance there is a dpc tray between the wall batts and the EPS insulation. In an attempt to ensure the swift removal of moisture the EPS insulation was cut at an angle; allowing the moisture to flow down the dpc and out the cavity. There are further steps taken in terms of moisture resistance; the fibreglass batts are woven in such a way that they are layered so any water that does come in through wind-powered rain will not penetrate beyond a minimal surface layer. In terms of thermal bridging it is quite obvious that this block cavity is super insulated; however this detail focuses on eliminating all thermal bridging. There is a thermal bridge across the typical stainless steel tie; for this reason Teplo ties were used. Teplo ties are made of resin and basalt; they are extremely strong and are a good insulator. This is just one example of the high level of detail involved in building a Passivhaus. The Irish U value (Part L 2011) for a block cavity wall is 0.21 W/m2K; this does not satisfy the passivhaus standard. 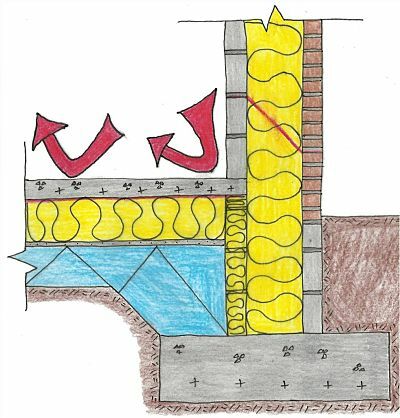 When we examine the typical block cavity system we can discover flaws in its design; due to the levels of insulation, there is high heat loss through the walls which is not feasible when trying to achieve the passivhaus standard. In the Denby Dale Passivhaus there is 300mm of insulation in the cavity to prevent heat loss; this is over double the Irish standard. In addition the Denby Dale construction utilises Teplo wall ties to eliminate thermal bridging and ensure minimum heat loss through the structure. The windows in the Denby Dale passivhaus are positioned halfway within the insulation layer in a within a plywood form box, to try to improve performance and minimise thermal bridging. The plywood box system was built into the wall construction by the block layers; ensuring accuracy with regards the positioning of the windows. To further minimise heat loss an Ecopassiv timber window was utilised, with a whole-window U value of just 0.8 W/m2K. 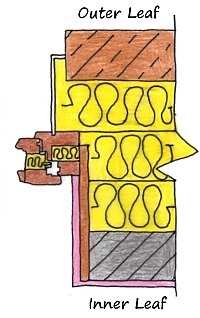 The final aspect of heat loss is in relation to thermal bypass due to the positioning of the window, however this was addressed with the use of an aluminium cavity closer. After thermal bridging the next aspect we must examine is the airtightness of the structure. The Irish standard for this is 7 m3/h.m2 at 50 Pa; this is in comparison with the passivhaus standard of 0.6 m3/h.m2. A key point to understand in block cavity construction is that plaster is airtight. This means once the entire surface area of a wall is covered in plaster there will be no air leakage. However at junctions where there is differential movement; airleakage can occur. To prevent airleakage problems at these junctions airtightness tape was used in tandem with wet plaster to ensure an airtight seal. This simply portrays the level of detail involved in Passivhaus construction. The U value for an Irish (Part L, 2011) block cavity roof system is 0.16 W/m2K, this is very close to the passivhaus standard of between 0.10 - 0.15 W/m2K; however it still does not satisfy it. 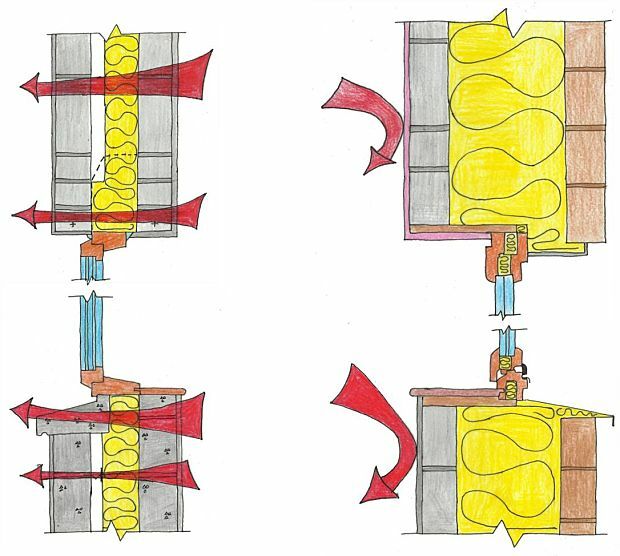 When we examine the Irish block cavity system we can discover flaws in its design; due to the levels of insulation there is high heat loss through the structure which is not feasible when trying to achieve the passivhaus standard. 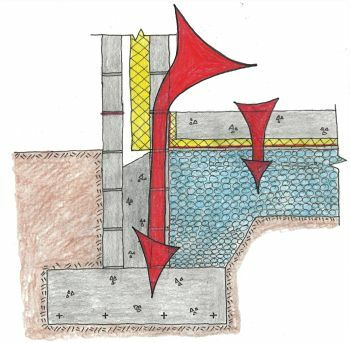 With regards airtightness; quite a high level can be achieved by simply parging the walls and ceiling; however there is the risk of airleakage at junctions where differential movement could occur. The sketch below is the Denby Dale passive roof. 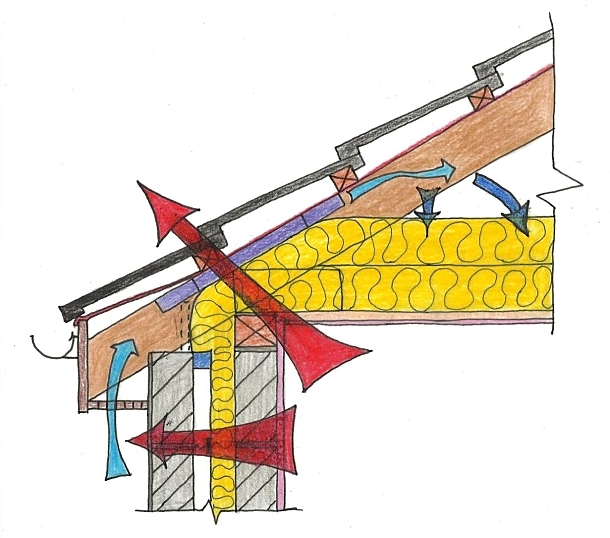 In this detail thermal bridges and air leakage which are evident in the traditional Irish block cavity roof are eliminated; this provides the structure with the opportunity to reach the passivhaus standard of between 0.10 - 0.15 W/m2K.